Recently Steph was asked to take part in a project on the accessibility of online fashion shopping. Collette Costello, creator of Kiku Girl Accessibility Fashion Technology Blog spoke with Steph and two others for comments. From the responses she received, Collette made a video on what makes a good inclusive online shopping experience. Abby: Hi Collette, it’s a pleasure to meet you. Can you tell our readers what Kiku Girl Accessibility Fashion Technology Blog is about? Collette: My blog and Kiku Girl You-Tube Channel are about making the future of fashion and wearable technology more fun and accessible to young people. I started by looking at new technologies like 3D printed dresses and machines that fold your clothes for you. When I recognized a gap, I began to focus on how to make the world of fashion more inclusive by using technology. Ultimately a more inclusive fashion environment will lead to improving the online shopping experience for everybody. Abby: I noticed on your ‘About‘ page that you educate women interested in STEM. What was the driving force behind your decision to work with this particular group? Collette: I’ve spent many years working in and lecturing about the fashion industry with an interest in the future of fashion and wearable technology. I found many of the designs for fashion technology clothing are not fashionable. There seemed to be this divide between the technology people and the people most interested in fashion—young women. This is because lots of young women don’t choose STEM careers and are more interested in creative subjects. I wanted to show that fashion technology could be fun, exciting, and inspiring. Should they desire, they could have a future career in STEM. Abby: Historically the beauty and fashion industries are not inclusive. Have you noticed a shift in how these industries are looking at people with disabilities (PWDs) as a market segment? Collette: The fashion industry is all about making money with mainstream products, and advertisements. The majority of which target the masses, not the individual. We’re beginning to see more niche markets with PWDs included in fashion advertisements. While this still more about making a statement, meanwhile, a quiet revolution of ordinary people is occurring. Beauty and fashion bloggers living with disabilities are defining what it means to have an interest in fashion and beauty. A big issue is the more specialised an item of clothing the more expensive it is to make. With technological advancements such as 3D printing, it’s becoming cheaper to make more personalised products. Because of this, we may see more fashion items for PWDs in the future. Abby: Technology is making a dramatic improvement in the lives of PWDs. Do you envision more employment opportunities within the field of fashion for PWDs because of some of the technological advances? Collette: The focus at the moment is more about what fashion technology can do, like your bracelet turning into a phone. I began to feel the needs of the consumer were being compromised because everyone was so focused on the future. They weren’t looking at how the technology we have now can be used to benefit the user. This is the reason I made the “How Accessible is Fashion Shopping On-line?” video to highlight this issue. I see accessibility as being the future of technology and it is this which I think will create employment opportunities for PWDs within fashion. Imagine PWDs working with fashion companies to make sure their websites, shops, and products are accessible and usable. Also, I think companies will gain a better understanding of disabilities and break down some of the prejudices around the hiring practices of PWDs. Abby: Can you recommend a few fashion resources for PWDs such as books, websites, designers, etc.? Collette: A great blog that is giving style and beauty advice in the form of podcasts is Inclusive Style, they are pioneers in this area as I have never heard an audio fashion blog before. Blue Badge Style is another blog dedicated to highlighting accessible venues and products that are also stylish and fashionable. Open Style Lab is an organisation that design innovative clothing personal to each person’s disability, projects include speakers built into clothing to help people with speech problems, other ideas are using conductive fibers so wearers can control their wheelchairs by touching their pocket. Abby: Thank you, Collette, for stopping by and taking the time to chat with me. 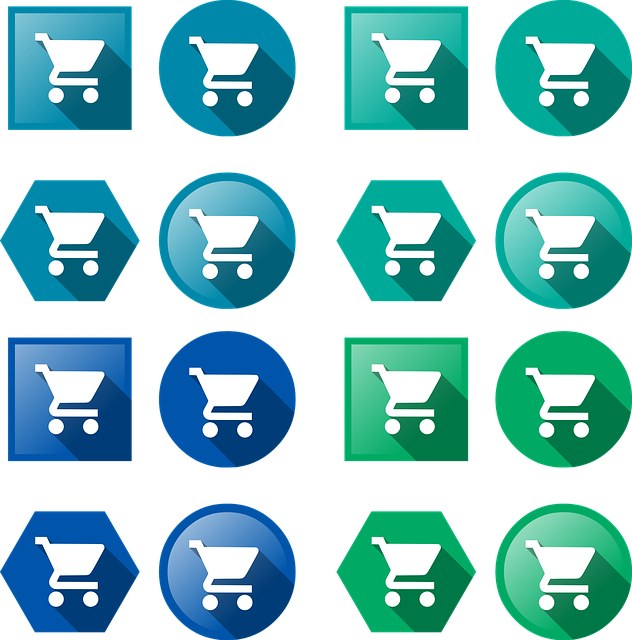 The image is twelve online shopping cart icons in various shades of blue and green. Each of the icons are square, circle and hexagon shaped. The image is a simple black and white photo of a silver key approaching a black keyhole. Oh this is cool. Thank you for providing the link.